Let’s talk more about elder and dependent adult abuse and protection, and why we are failing in California. Prevention and remedies are ridiculously inadequate and archaic, particularly taking into account the numbers of cases of abuse. I first started bringing elder and dependent adult abuse cases in 1993. My cases were primarily for physical, care, mental, undue influence, duress, fraud, financial, theft, real property, trust, and will abuse. I have to say that the more that things change they also stay the same. The same types of abuse still occur, and they always will. The cases were difficult then, and they still are. These cases take time and expertise. There is often difficulty obtaining evidence. And defendants really fight these cases, always arguing that nothing wrongful occurred, that the victim rightfully knew what they were doing and of their own free will, and in physical abuse cases that the injury naturally occurred due to the victim’s naturally poor condition. In other words, everything was known and on the up-and-up. Defendants in these cases count on the prospect that you will have difficulty proving the case, and that you will go away eventually for lack of resources and time. Nothing has really changed. We should ask, what resources are available to fight elder and dependent adult abuse? The first line of prevention and defense includes good people who are family, friends, professionals such as doctors, bankers, caregivers, accountants and financial advisors, and sometimes other third parties. Will these people recognize the possible or actual abuse, and then also take action? Do they even know what action might be possible and who to contact? If so, most likely only to a certain limited extent. The next line of defense probably includes law enforcement, adult protective services and the district attorney. Most likely these people only get involved because someone in the first line of defense has contacted them. I have previously discussed the inadequacy of the second line of defense – they simply do not have the time and people power and resources to handle the numbers of possible or actual abuse cases, or to stick with the cases long-term. They can pick some cases to attempt to handle. I would say that the third line of defense includes the private attorneys. There are resources in this category that are under utilized, at least in part because people in the first category don’t know who to contact, people in the second category don’t know who to contact and aren’t authorized to contact or won’t contact people in the third line of defense, and it is also true that private attorneys also have resources and abilities that are not unlimited and each case must also be evaluated. Improvements can be made to the situations described above. In particular, problems and issues relating to people in the first category, the first line of prevention and defense, can be improved by getting the information out so that they can better spot abuse or possible abuse and take action. Problems and issues relating to people in the second category, the second line of defense, can be improved with additional funding or monetary resources, and by having people in the second line of defense refer people or cases to the private attorneys in the third category or third line of defense. And efforts can be made to further educate attorneys in the third line of defense about the procedures, causes of action, and remedies that are available to them. Similarly, additional effort needs to be made to educate the courts, judges, and other legal system professionals about types of abuse, evidence that abuse has occurred, and the procedures, causes of action and remedies available. 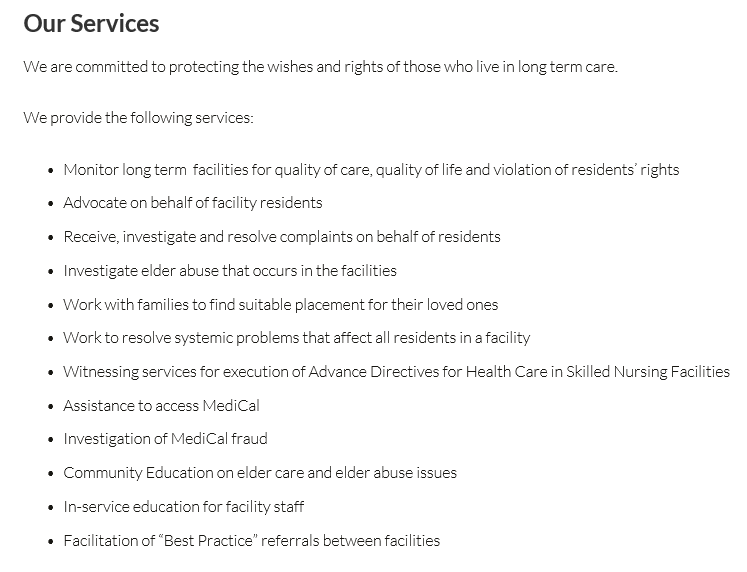 And let me discuss one additional program, the ombudsman program, which every county in California is supposed to have, and the members/volunteers of which go into the nursing homes (SNF) and residential care facilities (RCFE) and similar entities to check on the care provided and advocate on behalf of the residents. I’m a board member of Ombudsman Services of San Mateo County, California. This is a tremendous nonprofit organization. They do great work. Ombudsman Services organizations do vary from county to county – they are run different, they have different funding, they have different numbers of volunteers, they have different training, they have different decision-making processes, and some are county-run whereas other’s are separate nonprofit entities, etc. 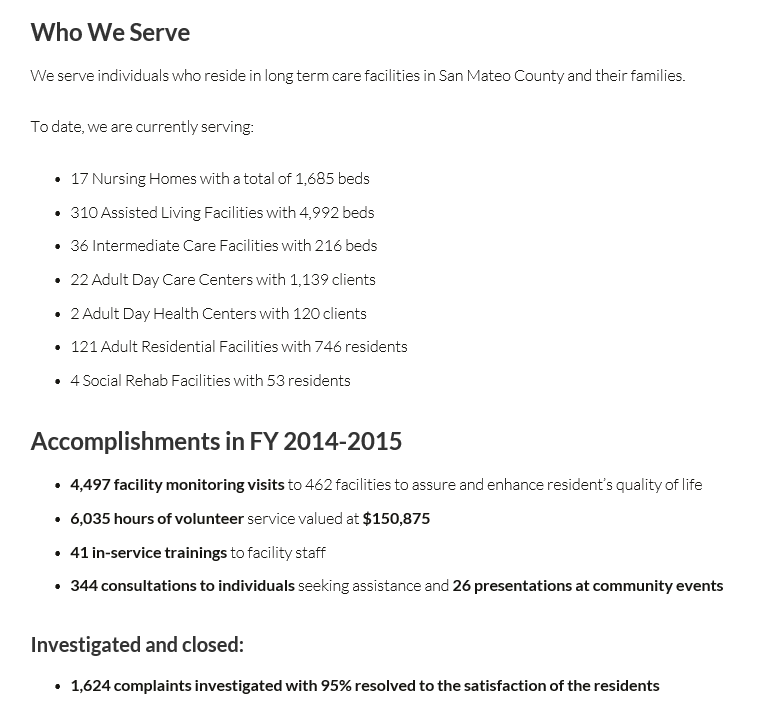 Here is a link to Ombudsman Services of San Mateo County, http://ossmc.org/. I ask that you also donate to them if you wish. That’s all for now. These cases really haven’t changed for over 20 years, in my experience. 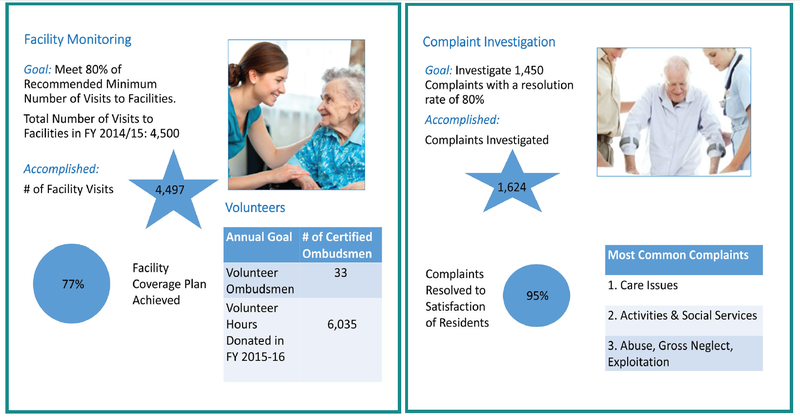 You might hear a commercial about reporting elder abuse, and those commercials are important, but it is really about having numbers of boots on the ground that make a difference. If the boots and referrals aren’t there, nothing will be done or remedied, and it goes on and on. 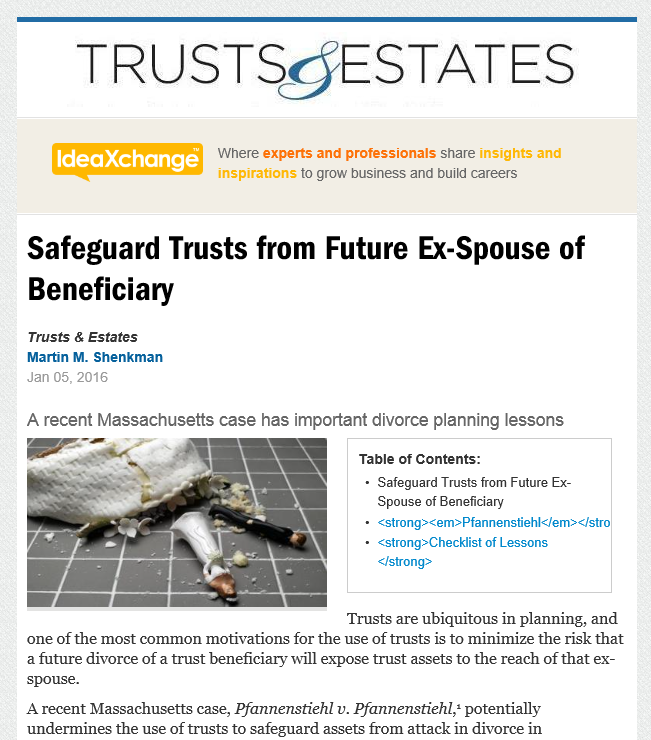 Is Your Trust, Estate, Power Of Attorney, Conservatorship, Or Care Situation Contentious? Posted on January 14, 2016 by David Tate, Esq. Are there disagreements and disputes in your trust, estate, power of attorney, conservatorship or care situation? That’s not unusual. In fact, based on my experience, I would have to say that it’s pretty common. But it can also be a game changer. Generally a fiduciary such as a trustee, executor or conservator, and sometimes an attorney in fact, should always hire an attorney when challenging or difficult issues or significant assets are involved. The question is whether one of the parties who is involved in the situation has, or needs to, or may, or likely will hire an attorney with a view toward litigation? That’s a game changer when that possibility might occur or actually does. Trust, estate, conservatorship, power of attorney, care and elder abuse situations and litigation are complicated legal practice areas that typically can involve a lot of emotional feelings and mistrust, and that require the attorney to know multiple areas of law and court procedure. If you are a fiduciary such as a trustee, executor, conservator or attorney in fact you need to hire an attorney who can advise you properly about your responsibilities and on the administration of the trust, estate and assets, or on the care and daily living needs of the conservatee or person in need, with a view toward helping you to satisfy your responsibilities effectively and correctly, practicing prudent risk management and documentation, avoiding liability and litigation, and prevailing in court if the situation ends up in court. If you are a beneficiary you need to hire an attorney who can steer you correctly to help you protect your rights and obtain the assets that were intended for you, and not waste your resources and the resources of the trust or of the estate, or possibly cause you to be surcharged for the attorneys’ fees of the other side, with a view toward prevailing in court if the situation ends up in court. If you are a beneficiary you also don’t want to unknowingly contest a trust or will or possibly disinherit yourself. And if you are a trustor who is no longer trustee, or a principal under a power of attorney, or a conservatee, you need to feel and know that your physical, mental and financial needs and rights are correctly and timely cared for and protected, and you might also need to be represented by legal counsel. In fact, if the situation ends up in court, in some situations, such as in a conservatorship, you have an absolute right to be represented by an attorney, and in other situations the court should and will on its own appoint legal counsel to represent and advocate for you. Contact me if you would like to discuss your situation. You can contact me by sending me an email at davetateesq@gmail.com. Before we discuss your situation I will need to know the names of the people and attorneys involved to check for any possible conflicts. Posted on January 11, 2016 by David Tate, Esq. Posted on January 6, 2016 by David Tate, Esq. Posted on December 14, 2015 by David Tate, Esq. I can say this – absolutely. California judges need more, and more detailed, education about probate, wills, trusts, decedent’s intent, mental capacity, undue influence, fraud, conservatorships and elder and dependent adult abuse. I’m not saying that all judges need more education – some are quite experienced in these areas – but over the past several years I have been running into situations where judges who primarily handle civil or criminal matters are also assigned probate related cases. And this can happen in any court for trial purposes because even in courts that have dedicated probate departments, the trial of a probate case that will take longer than a day will probably be assigned to the master calendar for trial and judicial assignment. I’m not faulting a judge for not having experience in these areas – I am faulting the system and the judiciary education system. While, yes, it can be argued that it is then for the attorneys to educate that judge, if I’m a judge and one attorney is saying that the law and the required outcome are “X” and another attorney is saying that the law and the outcome are “Y,” as the judge I don’t know who to believe. And add to that the fact that probate, wills, trusts, intent, mental capacity, undue influence, fraud, conservatorships and elder and dependent adult cases and evidence are detailed and complicated, including the law in those areas, which is also regularly changing, and you have a recipe for erroneous decisions, and also opportunities for less than honest counsel to exceed the bounds of advocacy and improperly twist or spin the law and the evidence. These are important cases. They are the probate court version of family law – important issues, very emotional, and people related and impacting.